Thank you, thank you, thank you! Amy and her marvelous ADDled blog, proffered my Silent Isle the award of Versatile Blogger. While I’m not fully sure what the award entails—i.e. what about me is versatile? My writing? My subject matter? My inability to resist perusing various products from nefarious peddlers?—I am absolutely delirious about winning this award. Because awards are everything. And I MUST win them all. (Wait. Not true.) If you follow me on Twitter you would have seen my celebration plan consisted of consuming a donut, except my husband ate them all because I think he’s still bitter that I blogged about our unfinished bathroom. But fret not, because I was running so late for work today that instead of eating a nutritious breakfast I stopped at Sheetz and bought the icing-est donut I could find. We’re all good now. Celebration is back on. (Okay, if I’m not careful, in my happy delirium, this may turn into an If-You-Give-A-Pig-A-Pancake kind of blog post. This is why I’ve never been allowed to give speeches at the Academy Awards…well, not the only reason. Focus, Anna!) I do, sincerely, say thank you, Amy, for your support of my newbie-blogger floundering, for your encouragement, your hilarity, and your perpetual transparency in all you write. 1. Thank the blogger who nominated you and include a link to their site. 2. 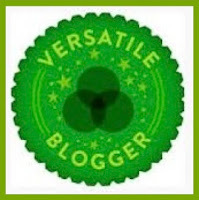 Add the Versatile Blogger Award picture to your blog post. 3. Nominate 7 fellow bloggers that you've recently discovered or follow regularly and include a link to their site. 1. Jeane at The Coffee Cottage—she is hilarious and honest and tells the best stories about mothering her squad of littluns, her massive Aqua Net bangs in her middle school years, and the chickens out back. 2. Karen at The Wordshop—she writes as she speaks: genuine, reflective, snarky, hilarious. A lover of writing, music, travel and food. One of the most beautiful people I know. 4. Alison at I Married a Contractor—she shares about family life and writing life in a way that makes you feel as though she’s chatting with you over a cup of coffee. I love chatting and I love coffee. 5. Drema at The Grammar of Painting—she is quirky and artsy and has fantastic energy. I have admired Drema’s writing for several years, and when I think of her the word that comes to mind is: whimsy. 6. Kate at The Nested Blog—Okay, Amy also nominated Kate, but I love Nested so much that I don’t care, I’m nominating her too. She’s hilarious, she has a strange affinity for grumpy animals, and she actively abhors Twilight even while in the midst of watching it. And she taught me Twitter—I’m eternally grateful. 7. Bev at Black Ink Paperie—I have only recently started following her blog and it is some of the most beautiful writing I have clapped eyes on in ages. Touching, funny, exquisite. I cannot get enough. 4. I am a grad student and am perpetually waiting for them to figure out I’m an untalented fraud and boot me from the program. 5. I quilt. With a machine. (No, that’s not cheating, Mom!) And I crochet, but only in a straight line—so scarves and blankets are all I can produce, but they are always a big hit at Christmas and baby showers. 7. I have degrees in English and Psychology—so if we ever chat face-to-face I am analyzing both you and your grammar. We have HUGE amounts in common, Anna: 1,3,5, and 6. And half of 7. English major - applying to Ph.D programs in psychology. And thank you for the nomination!!! I'm so tickled! You are absolutely welcome, Kate! I think for my next blog I'll write about my crazy first day as a psyc intern. Good stuff--the world of psychology is hilarious. I heard you had a neighbor who gave CPR to his chicken. Just thought if you couldn't put it in a book, you could always fit it in here. Play Clo. I am desperately thinking of a way to incorporate Chicken CPR somewhere. And, yes, Play Clo. All in good time. Oh, hey, I'll keep buying Barbie clothes off you if you follow my blog. I'd love an even 10 followers :) Haha! Love you! dear anna, thank you so much for the nomination and for saying nice things about me. i like nathaniel hawthorne. i knit and do embroidery so me could trade skills whilst you analyze me. thanks again. Hi, Bev - It's so nice to "meet" you, and thank you for following my blog! I look forward to reading more of your work and getting to know you better. Thanks so much, Anna, for nominating me for the super cool blogger award. I'm happy to know if I get into some sort of legal trouble blogging you can give me advice. In return, if any of my education at the school of hard knocks can benefit you, I am at your service.